GSMC is located in the Memorial Park Cemetery at 9370 East Washington St., east of I-465. Originally built in the 1920’s, this historic building served as the offices of Memorial Park until the 1990's. Now it is ours for many years to come! We have an expanded and more accessible library, as well as the ability to host more educational programs. 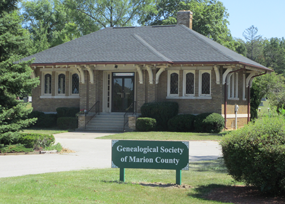 During 2018 the Genealogical Society of Marion County Research Library is open on Wednesdays starting 1/10/2018 (except legal holidays) from 11 AM - 4 PM and the second Saturday of every odd month from 9 am - 3 pm. We can also schedule appointments for research at other times. Please contact Librarian@GenealogyIndy.org. Location: 9370 E. Washington Street, Indianapolis, IN 46229. Directions: Take I-465 to E. Washington Street. At the exit, head east. We are located about 1/2 mile east of Post Road. Our library is inside the grounds of Memorial Park Cemetery. As you enter the cemtery we are on the right. Memorial Park is operated by the Washington Park Cemetery Association, an Indiana not-for-profit orga­nization and affiliated with the Buchanan Group. Need Help With Your Genealogy? Our library staffers can help with your genealogy research. Are you interested in small group classes? Let us see if we can arrange it.